Well, it's 6 days into August and nearly a dozen TRs have been posted here, but none are from Squak Glacier?? The Squak is still in great shape, even though snow conditions have changed somewhat after a week of thunderstorms bringing snow and rain. I think it's still currently the best ski route overall in the lower 48 by a wide margin (considering vertical + snow conditions), has been so since the latter half of July, and is likely to remain so through the month of August until crevasse conditions deteriorate. Carving smooth sweet corn on the Squak Glacier. 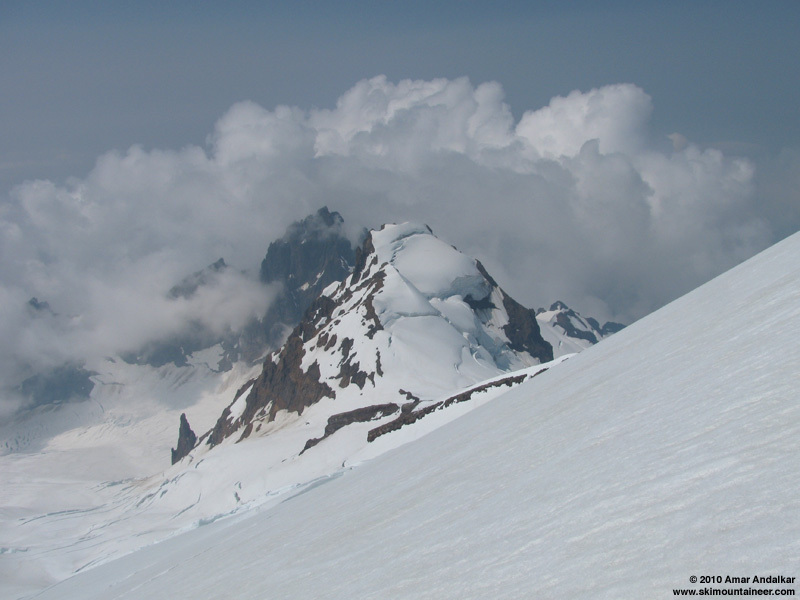 Following the electrifying experience of the thunder-snowstorm on the last day of July (see July 31, 2010, Mt Baker, Squak Glacier Snowstorm), the forecast for the North Cascades over the next 5 days included a significant chance of afternoon thundershowers on every single day. Finally, Friday the 6th looked to be the first day with just "mostly sunny" and no mention of thunder, and the forecast for the subsequent weekend looked downright poor, bringing the first significant storm system into the Pacific Northwest since the 4th of July weekend. 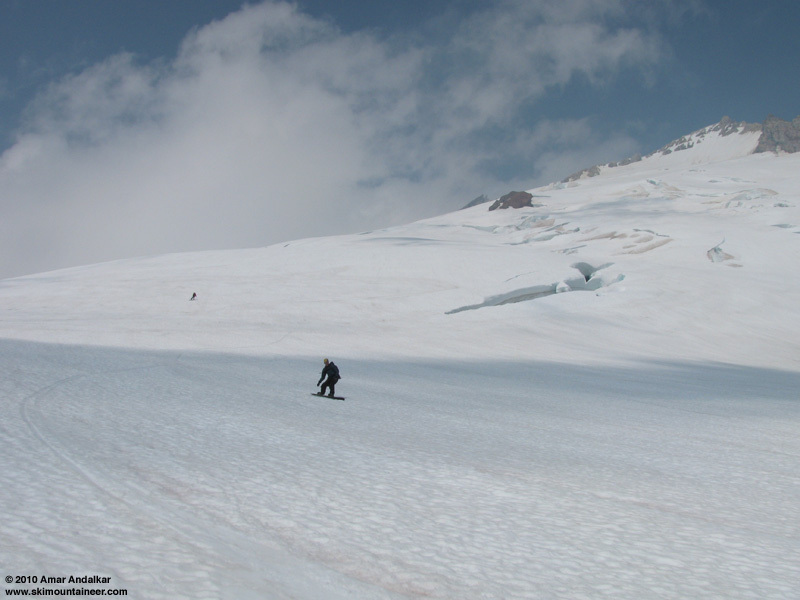 So Friday it had to be, for my fourth ski trip up Mount Baker in 14 days (3 by Squak, 1 by Coleman-Deming). I've never been up a major peak so frequently in such a short period, but when it's this good and other comparable competing options are becoming limited, you gotta keep going back. Left Seattle at 5:30am, enjoyed a surprisingly quick drive to Schriebers Meadow trailhead in just under 2 hours, and headed up the Scott Paul Trail at 7:45am. The first snow across the trail is now at the 4600 ft saddle, and several large snow patches cross the trail over the next mile to 5000 ft, but nothing is continuous-looking anymore. Best to just keep going to the first large moraine (before the major creek crossing), and take the climbers path branching rightward up the moraine, which shortly deposits you onto thin but continuous snow at 5150 ft beside the creek. Otherwise stay on the trail past the creek crossing a few more minutes to reach a long narrow finger of snow reaching the trail, then follow this up between two moraines to reach the basin above. This moraine-ringed basin (just SW of Crag View) is still filled in well with snow, easily skinnable and skiable. 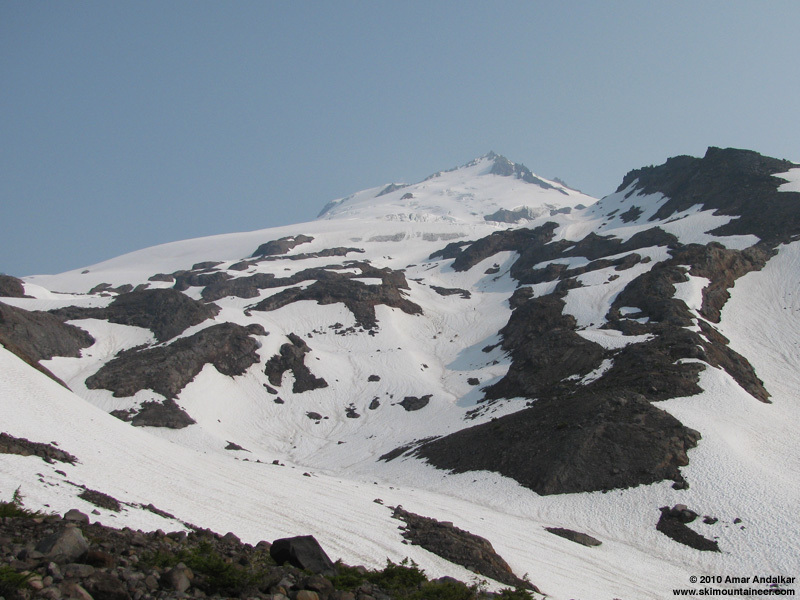 Looking up at Squak Glacier and Sherman Peak from the basin SW of Crag View. Caught up to a party of five skiers and boarders (including several TAYers) at the base of the ice cliff near 6700 ft, and informally joined them for most of the day. 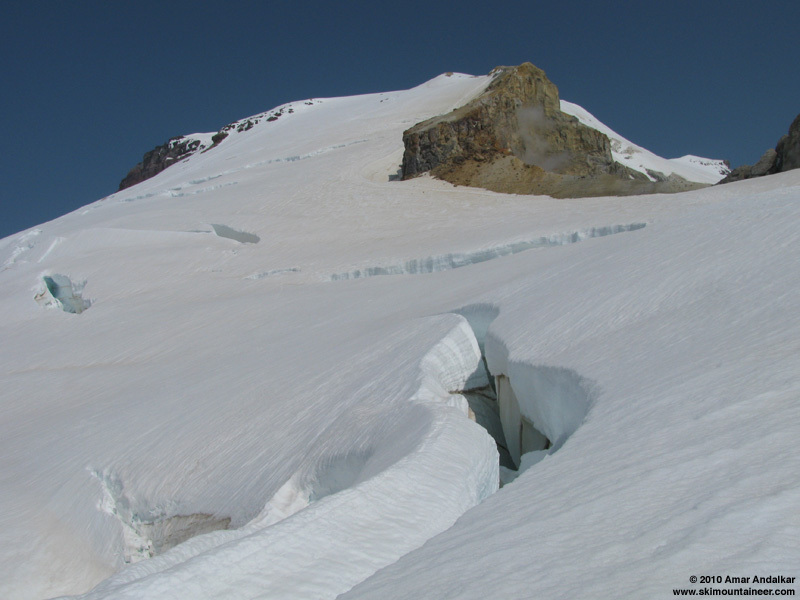 A few more cracks are beginning to open on the Squak Glacier below 8000 ft, and more caution is now necessary to safely avoid them. The crux crevasse at 9000 ft is becoming sketchy, as the solid isthmus crossing it has stretched and narrowed substantially over the last week, now only about 2-3 ft wide (but still full-depth and solid). An end run around to the west will soon be necessary, and already may be a safer (but much less scenic) option. Getting thinner: skinning the isthmus across the crux crevasse. The junction with the Easton Glacier route at 9400 ft is also becoming sketchier, requiring a significant zigzag between open cracks. The Roman Wall remains in good shape, still easily skinnable (ski crampons helpful, but not necessary) while avoiding the cracks which are opening across the bootpack. Looking up the Roman Wall from 9500 ft, with Grant Peak visible at right though the gap in the crater rim. Lots of haze and smoke still in the air as expected, obscuring distant views entirely all day. Clouds had been building all morning in the valleys, slowly rising upward with solar heating and seemingly chasing us up the mountain - 6000 ft, 8000 ft, 10000 ft, then eventually higher than the summit. Nevertheless, it remained mostly sunny on the mountain itself as we ascended. Clouds rising over the summits of Lincoln and Colfax Peaks. 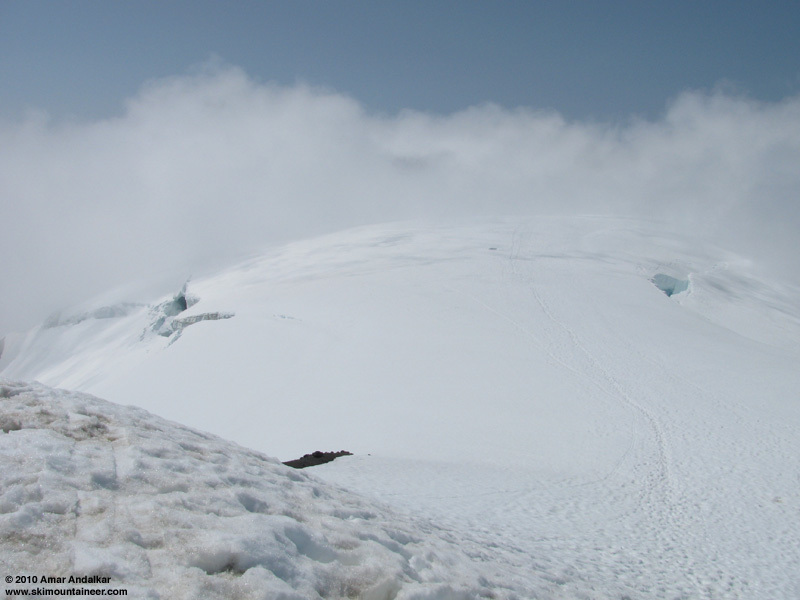 The uppermost slopes above 9500-10000 ft appear to have received several inches of new snow during the showers of the past week, filling and obscuring previous tracks. Ignoring the newer tracks which all headed straight up the summit dome from atop the Roman Wall, I broke my own trail contouring properly eastward at 10700 ft towards Grant Peak through 4-6" of partially consolidated new snow. Topped out alone on the summit at 1:20pm, in a stiff 25-30 mph NW breeze and surrounded by billowing clouds, rising above the summit on all sides. Clouds advancing across the summit dome towards Grant Peak. With the imminent threat of whiteout, I took a few quick photos looking down the Park Headwall and Boulder Glacier, then rapidly switched over. Skied off the summit at 1:30pm, and the first of several drifting cloud banks provided a few minutes of whiteout as I skied back along my skin track contouring the edge of the dome, only to quickly pass back into full sunshine. The steep roll atop the Roman Wall had already corned up nicely, while a bit lower down the smooth new snow was still only partly consolidated, carving shallow trenches in wet snow atop a firm base, but not bad at all. 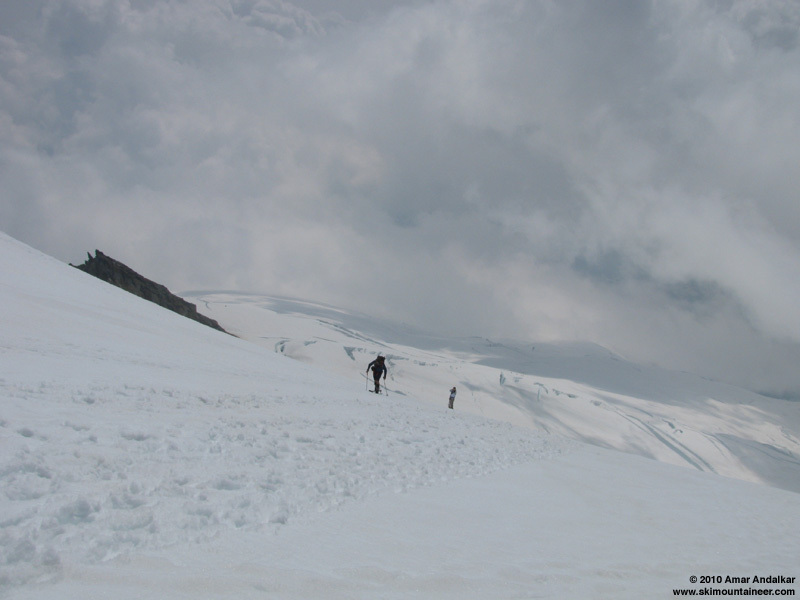 Skiing down the Roman Wall as others skin up, with roiling clouds below. Passed three of the group still skinning up the Roman Wall, and then caught up to the other two as they were skiing down near 9000 ft -- they took the end run around the crack, while I couldn't resist another schuss directly across the thinning isthmus. Overall, snow conditions on the glacier felt softer and less-consolidated than my other recent trips (probably due to the rain and snow), but are still fairly smooth and quite exceptionally so for August. Still some great turns and fun skiing. alecapone skiing past seracs on the Squak. 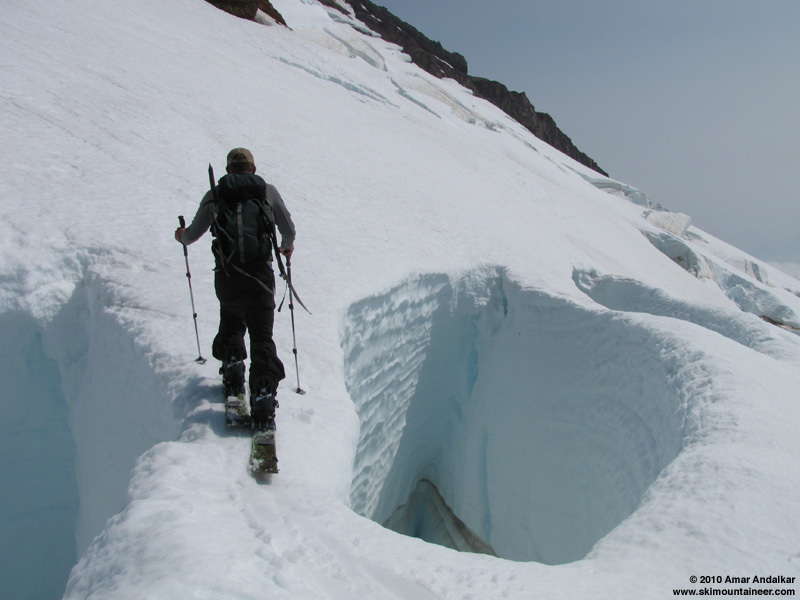 Below 6500 ft, the suncups and runnels are growing to typical midsummer size, and the skiing was quite bumpy as expected. Met another pair of my ski buddies who were skinning up through the basin here at 2pm, hoping the drifting clouds would open enough to grant them a fine evening ski run. I wished them luck and skied out along the thinning snow of the creek back to 5150 ft, took a long break, and then hiked back to the car just after 4pm. Mount Baker is still delivering the goods, with 7500 ft of total gain earning over 5600 vert of pretty fine summer skiing. Tara and I tried the Squak on Tuesday the 3rd. We turned around a liitle above 7000' due to thunder and lightning. Just when the snow started to get good. Maybe we'll have to give it another try next week. Nice report and photos Amar. I was just looking at your website in awe of the vert you have been putting in this spring. Awesomely fun day in the best of comapny and locations. Best birthday ever! Good thing I pushed them praxis pows up there. The 136 underfoot was much needed. Thanks very much to Sam tha man and his roomate Allen for hooking me up with the full dynafiddle setup. Capone on skis! I don't believe it! Thanks for the TR's Amar. It convinced me to take my 12 yr old brother up there to ski off the summit via the Squak last Sunday. 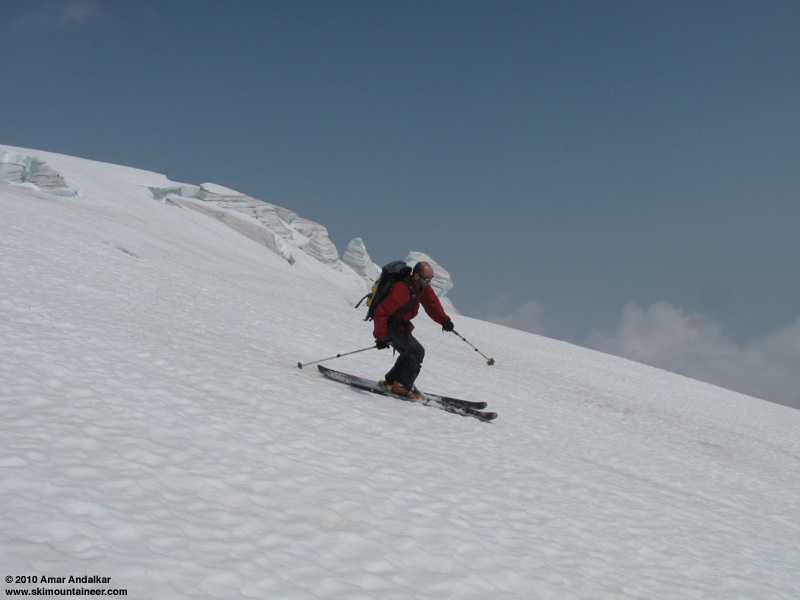 Nice report, and good conditions indeed.� Makes me want to leave the southern Willamette Valley and head up for a day or two.� Ale - I didn't know you skied - nice work! Edit: Ale - I just read your post on splitboard.com -too funny! Yeah, I Squaked w/ Scott.� It was a great day to be up there.� Thanks for including me, we had a fun group.� It was good to meet Allen and to ski with Jeff and Sam again.� Such a nice community of folks! Wow! Scott on sticks At least the skis were wide enough to roughly resemble a snowboard. Why the change Ale? Did Kyle finally comfiscate his snowboard? Just becasue I had the plastic boots and two planks and all, I wouldn't be so fast to call it skiing. I still have kyle's board. read; kyle is an awesome guy. Among other things, he let me use his split board since may. I owe him big! I just forgot the bindings at home. There's a problem with your skis though... the heels seem to be attached or something... it's weird. Must be broken. Beautiful TR. I'm don't really like to ski in August, but these photos make it look awfully good. I'm not surprised to see Ale_Capone on skis ... he skis really well with his splitboard in tour mode. You should have seen him on the east face of Mt. Niagara earlier this year.